Staying in a casa particular or private rental is often the best way to connect with Cuban people during your stay on the island. Take a look at this rundown of 10 of the best houses in Havana. This place offers a great location on the edge of Vedado, and sea views over the Malecon from the balcony. Lourdes, or Lulu as she prefers to be known, is a gracious host full of advice on what to see and do, and she also speaks four languages. Another Old Havana apartment in a great location, this chic place is well furnished and has two triple rooms for up to six guests. You can get the whole place for four guests for £350. Breakfast, daily cleaning service and one hour of wifi per day are included in the price. Splurge on this luxury three-bedroom apartment, owned and designed by two architects. The whole place is fantastic, and at £119 per night it’s not too expensive if you go as a group. It’s well located in Centro Habana as well. Smack bang in the middle of Old Havana, this boutique rental is in a great location. You can get your own apartment for around £170 per night, or an en-suite bedroom for around £60 per night. It’s a relatively new place but it’s great for those who want to make sure they can book accommodation online before they travel. An absolute bargain at £28 per room per night, this Old Havana property has been lovingly furnished with amazing antiques. Both rooms have en-suite bathrooms and balconies with views over the plaza below. Each of the three bedrooms in this Art Deco house is available for around £28 per night. 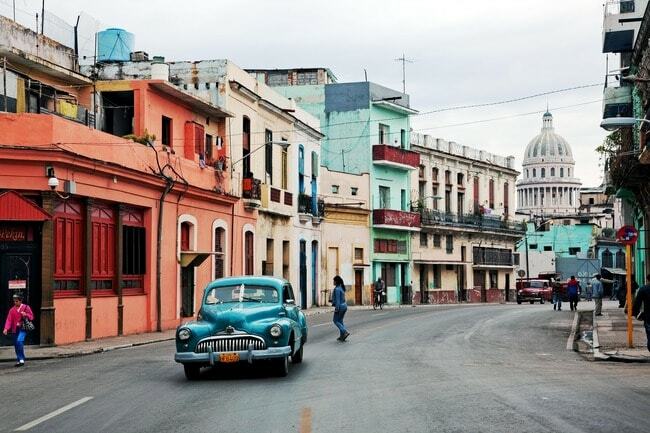 It’s in the middle of Centro Habana, a gritty district that is perfectly placed between the Old Town and Vedado. The patio is a great place to enjoy a relaxing sundowner. This place receives rave reviews, thanks to the efforts of hosts Jorge and Marisel to make visitors feel at home. It’s a couple of blocks away from the iconic Habana Libre Tryp hotel in Vedado, so you’ll always be able to find your way home. Rooms are available for around £28 a night. This 14th-floor apartment has four bedrooms and amazing wraparound windows offering breathtaking views over the city. Host Marta is fluent in English and offers rooms for around £28 per night. There are five rooms available in this large house, all of which have high ceilings and comfortable furnishings. It’s around £28 per night for a room and there are two lounge areas for relaxing after a long day of walking around the local Vedado neighbourhood. If you want a bit more peace and quiet, head out to this house in Siboney. It’s far away from the tourist hotspots, in an area where diplomats and their families live, so you’ll need to get around in taxis. On the other hand, you’ll get to enjoy a lovely pool, a relaxed atmosphere and some refined local restaurants.